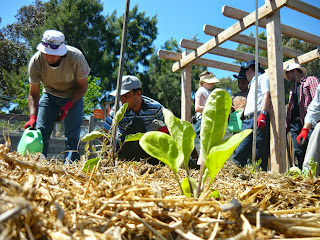 Moreland Food Gardens Network: Breakthrough! Moreland Council developing Urban Agriculture & Food Production Strategy. How you can help shape our city. Breakthrough! Moreland Council developing Urban Agriculture & Food Production Strategy. How you can help shape our city. These things are important because: a strategy should give aims, responsibilities, actions and timeframes and replace the ad-hoc response we've seen to-date; funding recognises that it requires special skills and real effort to get this done; the community is being invited to participate in the scoping so we have a chance to make sure it covers what it needs to. Read on for some background on how we got here and some ways you can now help deliver the kind of strategy we really need to support food growing and urban agriculture in Moreland. In 2013, when Moreland City Council committed to developing a community food growing policy we saw an opportunity to ensure that the City of Moreland took a long term approach to growing food in Moreland, a considered, innovative, progressive policy with vision and one that was of a quality what our community deserves. Something that would address a broad range of areas including employment, social capital, environment and health. Consult further with stakeholders on the elements required to extend this draft policy into a comprehensive ‘Moreland Urban Agricultural and Food Production Strategy’ and consider establishing a time limited Community Advisory Committee that would meet up to 3 times in 2015 to guide the development of the strategy. We count this as great news. Essentially the inadequate draft policy was withdrawn and it will be replaced by a strategy with a wider view on urban agriculture and local food production and the community will have a meaningful opportunity to contribute its the scope. Cr Rattnam deserves recognition for engaging with the community on this and for her part in achieving this outcome. We're getting towards the middle of the year already and the strategy scoping has yet to start, you'll now find item 8 has just been addressed here but more importantly, as already mentioned, the community advisory committee is now being formed. It's vital that Moreland Council don't waste this opportunity to establish a solid, supportive and comprehensive foundation for urban agriculture and local food for our future. We want to make sure council keeps moving. 2. Email, call or meet your Moreland councillors. Those for your ward or all of them - their email addresses are below. Not sure which ward you are in? you can check here and find their numbers. Tell them your local food story, why you want more food grown in Moreland and why you support a ‘Moreland Urban Agriculture and Food Production Strategy’. Ask them what Council's position is, what they think, what the council's plans are. Every contact counts. Please take a few minutes to support this, regardless of whether or not you live in Moreland. State that local food growing can improve our health, reduce our carbon emissions, connect our community, create jobs and stimulate our local economy. Provide a clear vision for local food growing and explain how they will help us to get from where we are now to where we want to be. Fund a role that will own this at council and support community-led programs to increase local food production and composting and work across council departments to help get things done. With your help we have the opportunity to provide input into a strategy that can really support local food and urban agriculture initiatives.